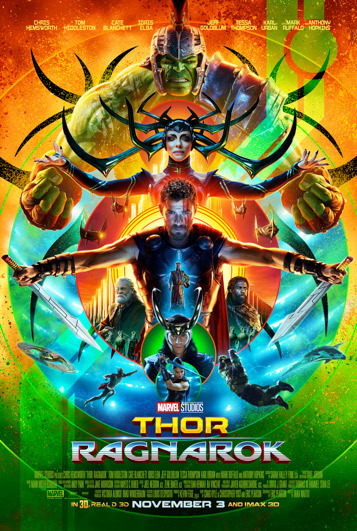 In Marvel Studios’ “Thor: Ragnarok,” Thor is imprisoned on the other side of the universe without his mighty hammer and finds himself in a race against time to get back to Asgard to stop Ragnarok — the destruction of his homeworld and the end of Asgardian civilization — at the hands of an all-powerful new threat, the ruthless Hela. Kevin Feige is producing with Louis D’Esposito, Victoria Alonso, Brad Winderbaum, Thomas M. Hammel and Stan Lee serving as executive producers. The story is by Craig Kyle & Christopher Yost and Eric Pearson, and the screenplay is by Eric Pearson. Marvel Studios’ “Thor: Ragnarok” thunders into U.S. theaters on November 3.